A suspect vehicle and a white Mercedes-Benz seen mangled after a crash that ended in North Hollywood on Monday, Nov. 6, 2017. 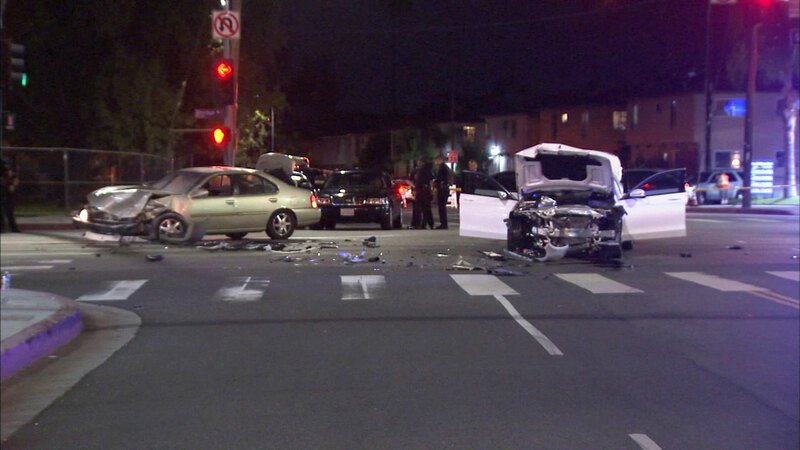 NORTH HOLLYWOOD, LOS ANGELES (KABC) -- A brief chase ended in a vicious crash after the suspect slammed into an innocent driver in North Hollywood Monday night. The driver of the white Mercedes-Benz didn't have a chance to even react before she was hit. Her brother, Ago, was sitting in the backseat. "We were stopped at the red light. Once the light turned green, we started going, and there was a big explosion, I'm guessing from the air bags," he explained. Ago didn't give Eyewitness News his last name, but he gave a pretty good idea of what it was like when the Nissan slammed into his sister's car at the intersection of Sherman Way and Whitsett Avenue. It all happened shortly before 7:30 p.m.
Ago's girlfriend was sitting up front in the passenger's seat. They were on their way to dinner. The chase suspect was arrested at the scene. Nearby resident Bernice Torres said she saw the suspect's capture unfold. "I came out running, and I see a whole bunch of people, and I see the guy in handcuffs and police. They put him inside the cop car and they drove away," she said. Metro police were nearby when they saw what looked like either a man trying to rob or threaten another man. When they tried to intervene, the man who appeared to be threatening the other took off and jumped in his car. That's when, investigators said, the driver slammed into Ago's sister. "The suspect does have outstanding warrants for his arrest, so that's where we are at right now," said Sgt. Art Talamante of the LAPD Metro Division.